If you and your partner are looking for a private and romantic spot for your honeymoon, check out the British Virgin Islands! The British Virgin Islands is a perfect spot if you and your partner are searching for a relaxing and romantic honeymoon. The beaches are bathed in white sand and the Caribbean waters are warm. Within the network of isles that make up the British Virgin Islands, many are only accessible by small, local boats. This means that it’s very feasible to have an entire beach, or even an island, alone to you and your sweetie. If the private island route doesn’t get you excited, there are plenty of all-inclusive resorts to stay at on the main islands. Here you can be tended to daily and explore the urban centers of the region. Whatever you and your partner are looking for in a honeymoon, the British Virgin Islands is the perfect honeymoon destination. The only problem with this beautiful locale is that you might never want to come home! The British Virgin Islands maintain a toasty temperature year round, rarely dipping below 60°F. Rainfall is a bit of a different story, however. Avoid visiting between July and early September to avoid hurricane season. The most popular time for vacations is from December to February thanks to the temperate weather. However, if you’re looking to avoid big crowds and big resort bills, try waiting until March. Prices tend to be more reasonable, the weather is beautiful, and there are fewer tourists. Buck Island: This secluded island is the only marine national park of the United States. 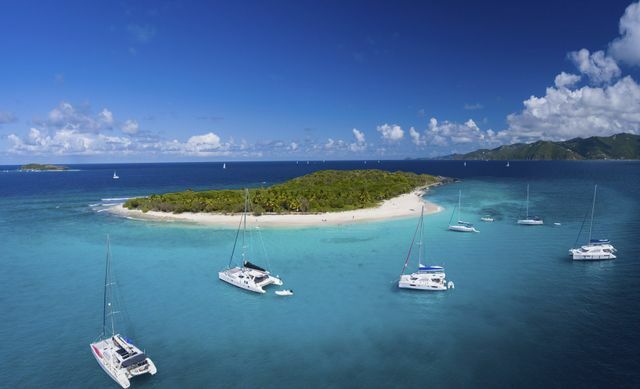 Jost Van Dyke: This island draws young visitors due to its party atmosphere. Virgin Gorda Baths: A romantic honeymoon spot that leaves visitors surrounded by massive granite boulders and clear waters. Redhook: A perfect spot for honeymooners looking for great food and drinks. Salt Island: A deserted island littered with salt water ponds and a deserted town only accessible with personal or rented boats. Devil’s Bay: A beautiful bay in Virgin Gorda filled with hiking trails and granite. Scuba Diving: A great honeymoon activity that is available nearly everywhere on the British Virgin Islands. Swim with Dolphins: Take a dip with beautiful dolphins in Tortola. Callwood Distillery: A historic rum distillery offering guided tours. Sage Mountain: Gives access to the highest point in Tortola. Nanny Cay: A small town with full amenities and services. Prickly Pear Island National Park: A beautiful national park riddled with private beaches and cacti.